My first day as a chef at Simon Gault’s former Shed 5 Restaurant the MasterChef New Zealand judge came to visit. “Your mate’s coming in today”, the Head Chef said with big grin on his face as I walked in the kitchen door. “I need you to do the hollandaise sauce”. “No problem Chef”, I replied and asked for the recipe. “You shouldn’t need a recipe,” he quickly quipped back “I’m testing you so make sure it’s good!”. 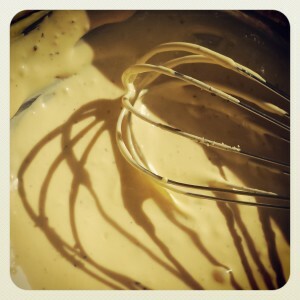 I had made hollandaise sauce before but not in a restaurant… and not a litres worth in one batch. My hands had been cramping up randomly too so I prayed they would make it through the whisking challenge ahead. The grill chef saw my look of panic as I left to get butter from the veggie fridge. “Ask Fish Section for vinegar reduction, he should already have some. 500g of butter should make enough for service.” He was my saviour but I still had to remember the ratio of butter to egg yolks to reduction/lemon juice! 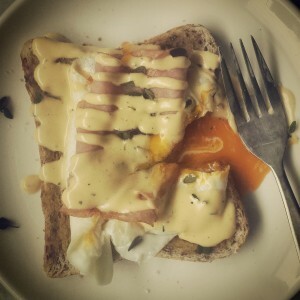 It had been a long time since I’d made a hollandaise. 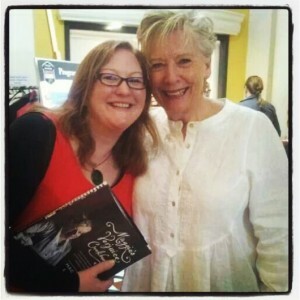 In fact, it was back in the MasterChef house – Maggie Beer’s Verjuice Hollandaise from her Maggie’s Verjuice Cookbook. She uses a verjuice reduction instead of vinegar or lemon juice. I have never been good at remembering recipes – even those I do often. I had to trust my gut and “taste, taste, taste”. In Maggie’s recipe she adds the reduction at the beginning with the egg yolks and melts the butter in a saucepan to achieve a nut-brown butter. This results in a beautifully nutty hollandaise with a hint of sweet from the verjuice which is truly addictive. As I put the butter in the saucepan, another chef snaps, “what are you doing???”. Sheepishly I replied, “melting the butter chef”. “Just melt it in the microwave!” he responded. I had learned quickly to do as I’m told in the kitchen. 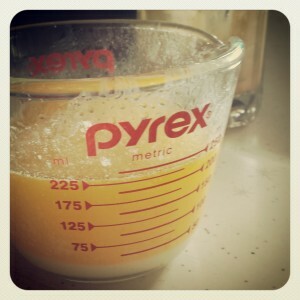 With butter in microwave, I finally started to whisk my eggs yolks with the reduction over gentle heat to a sabayon. Simon Gault walks over to my side, “how’s it going Elizabeth?”. I thought I’d left all my nerves in the MasterChef kitchen but I had been given the chance to work in another one of my culinary idols restaurants… the last thing I wanted to do was screw it up!!! Simon continued to question me as I whisked away. Strangely something I was used to but this line of questioning always grew seeds of doubt. “Have you already added the reduction?” he asked inquisitively. I couldn’t tell by his tone if he was insinuating that was the right or wrong thing to do! But even when I responded yes, he didn’t give anything away. Then as quickly as he appeared out of nowhere, he left with a “good luck”. Luckily my hollandaise sauce was a success. And even so, as soon as I got home I checked my partner’s old “Practical Cookery” book, from her culinary training – my bible of sorts, to see if I added the ingredients in the correct order. I learned I need to have more confidence in myself. Checking back on Maggie Beer’s recipe, I also learned you don’t need to whisk egg yolks over heat to get a beautiful hollandaise sauce if you have a small food processor or stick blender. Melt 200g butter. Let milk solids settle at the bottom of jug as pictured. 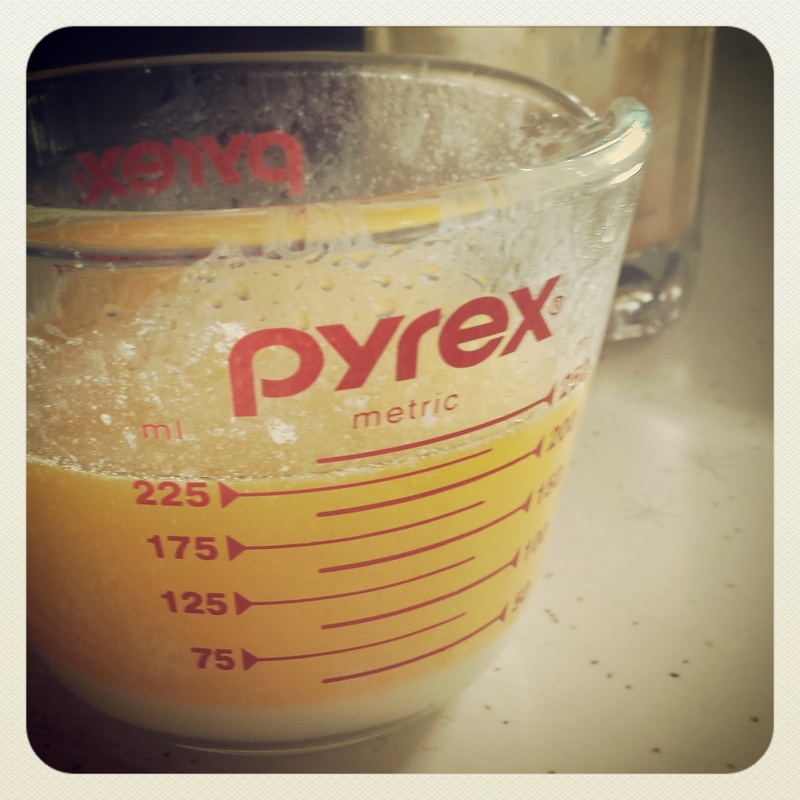 Melting butter in the microwave is an easy way to separate the milk solids… or try using clarified butter. Blend the 2 egg yolks, 1tsp salt and just 1Tbs of the lemon juice in a small food processor or with a stick blender. Blend until the mixture resembles the consistency of cream. Continue blending while slowly adding the warm butter making sure to leave the milk solids in the jug. 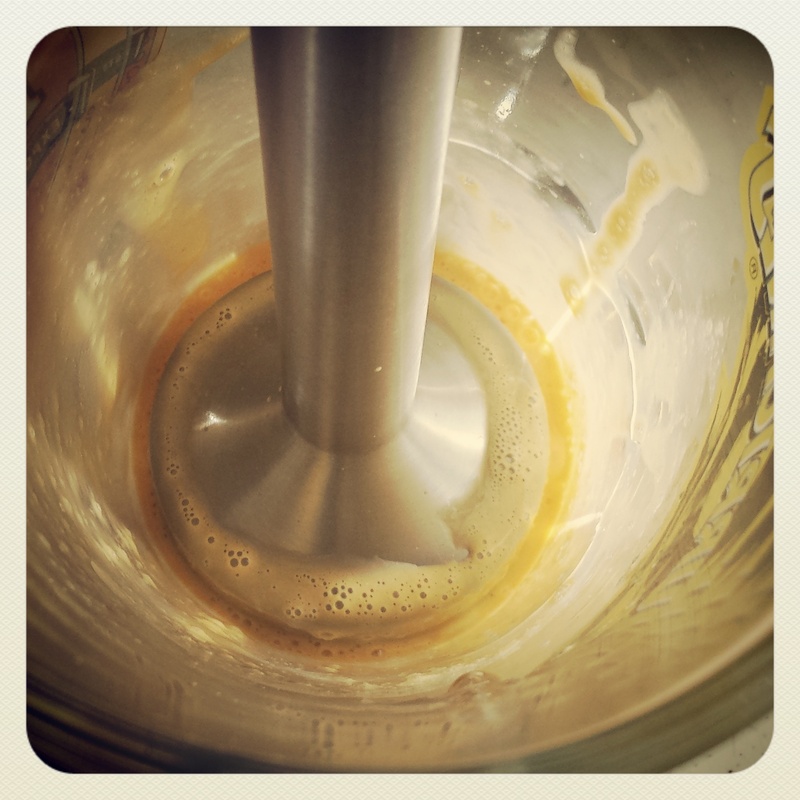 Using a stick blender or small food processor makes incorporating butter to egg yolks and lemon juice a cinch! The sauce will start to thicken. Once all the butter is incorporated add cracked pepper (or white pepper if you prefer) & check seasoning. If you prefer a runnier consistency, add some warm water. Mix in the remaining 1Tbs of lemon juice &, if you prefer a runnier consistency, add the warm water. Add more salt /pepper to taste & serve over vegetables, seafood or eggs. Egg’s Benedict with my Easy Hollandaise Sauce and thyme. I prefer using cracked mixed peppercorns even though they are quite visible in the sauce & I add whatever fresh herbs I have on hand at the end. Enjoy!